Comment: I would like to get an estimate for removing and replacing sections of a concrete walkway. Comment: HI there, We have a retaining wall that is in need of major repair-- both on the wall and the stairs! We can give you some additional specs if you need them! Thank you! Comment: I have a timber post concreted in my backyard that I put in myself that I use to string a hammock up. I made the mistake of using a concrete form and the post while still anchored has tipped about 10 degrees. I'd love to have the post and concrete removed and redone much better. I have a replacement post but don't have the concrete. Comment: I would like to get an estimate for pavers to be repiared. Comment: Small back yard has concrete patio approx. 21'x15' that is uneven and drains poorly. Need new flat patio nice looking, maybe looking like tile, maybe in colors? Welcome design ideas. Comment: I would like to get an estimate for pouring a concrete slab. Comment: Driveway needs repair, broken sidewalk near the curb. 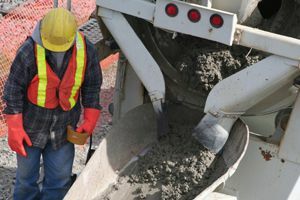 San Francisco Concrete Contractors are rated 4.77 out of 5 based on 482 reviews of 40 pros. Not Looking for Concrete Contractors in San Francisco, CA?